2. Place the tip of the screwed end of the stud on the surface of the tire in the marked location. 3. Applying steady force at right angles to the tyre screw very slowly into place. 4. 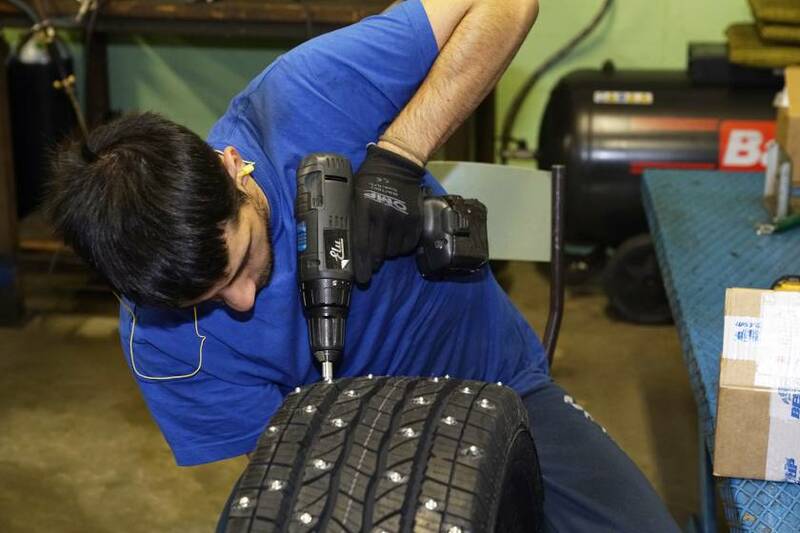 Tighten only until the head of the stud touches the surface of the tire. 1 – THE TYPE OF TYRE. We recommend using snow or off-road knobby tyres but any tyre of sufficient tread can be utilized. The prominance (of the stud) is a consequence given by the tire and the field of use of the stud (competitions,off-road, road). It is available to use not to much promimance studs, in the areas regulated by the Highway Code, while in the private areas you can use stud with a superior prominance. In both cases, always use all the available rubber of the tire to insert the longest nails so that it can work at its best. Once the tire has been selected, the depht of the tread or of the block is measured, then the under-tread is added, which in any tire of any vehicles is 2-3 mm, absolutely must not be anchored to the canvases. penetration of the stud into the rubber. (see table). If for your application you are forced to use studs longer than those that the tire can hold and you’re going to risk puncturing the tyre is recommended to use the anti-puncture liquid. This comes in different types and brands. We suggest those that are based on a water soluble gel that can be washed away with water and that does not unbalance the wheels nor damage the tyre or the rim. You can mount a stud with “penetration into the rubber” (see table) of 11.50 mm or less. So, the appropriate stud is type. 1200. (NB The thickness of the carcass cover is determined by the type of tire).